Have you ever guided your grandma, who called asking for help, through zipping a file and attaching it to an email? Like, with words? It's literally painful. We’ve shown you how to grab a screenshot, record screen video footage, and create animated GIFs, now it’s time to answer some of your burning screenshot-related questions. There's good reason why "show, not tell" is the rule of thumb for everything from UX design to tech support. So if you need to explain to someone how to do things on Mac, there's no better way than a snapshot, screencast, or animated GIF. In this post we'll show you how to do all three. Why use a third-party screenshot utility? 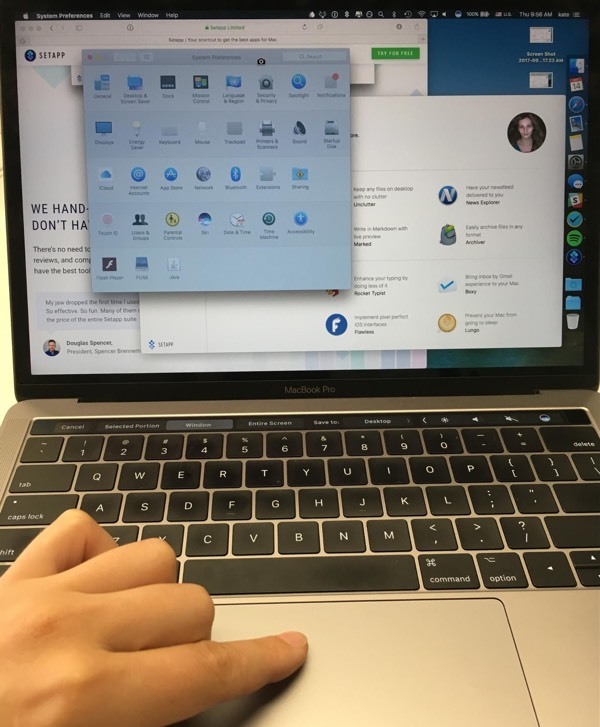 Is it possible to screenshot my Mac remotely? Where are screenshot images on Mac computers located? How to upload a screenshot and copy the URL to the clipboard after capture? Can I change the default name of a screenshot in Mac? What software can I use for stop-motion screenshots of my Mac desktop? If your question isn’t answered here, feel free to ask it in the comments and we’ll do our best to answer it there. Everyone knows there's a keyboard shortcut for that, but clearly not everyone remembers what it is, judging by some 100,000 people googling "how to take a screenshot" every month. To capture your Mac’s screen, you can either rely on the macOS native snipping tool or get third-party software that’s good for the job. ⌘ + Shift + 4 + press Space to take a quick screenshot of the active window. The resulting image will appear on your desktop as a .PNG file. With transition to Mojave, the macOS snipping tool became even handier. The new shortcut has been added, and it’s powerful – covering all the controls you need to capture a screen. Press ⌘ + Shift + 5 to launch the panel and see the options. They all are close at hand now. Once you take a screenshot, it instantly appears at the right bottom of your screen as a floating thumbnail. Without digging around, you can edit, annotate, and share screen captures from there. You can’t capture a scrolling Web page using native shortcuts. In case you have a cluttered desktop, you should prepare it for screen capturing by clearing away the icons. Apple’s snipping tool lacks easy-access perks and sharing options – all screenshots are automatically saved to desktop. Luckily, there are some apps that do that, so you should have no trouble finding a good one. Our personal favorites are Capto, a multipurpose screen capture utility for macOS, CleanShot for clutter-free screen recording, and Dropshare to store and share your screenshots. If you’re away from your Mac but need to grab a screenshot of your home desktop, you can do this by enabling Screen Sharing. Go to System Preferences and click Sharing. Click the Screen Sharing checkbox (if Remote Management is selected you’ll need to deselect it for this to work). Select the All users or Only these users (if your Mac has multiple users you can choose to give access to specific users or groups). Open a Finder window. Put the pointer on Shared and click Show. Click All to see the available computers and select your Mac from the list. Go to Screen Sharing > Preferences and set the Display to Scale to fit available space or Show full size depending on how large the screen of the computer you’re working on is. Use the Snipping Tool method to capture a screenshot. There’s a set of tools that make your screen capturing journey easier. Spolier alert: you can get your hands on the full pack at once. Use Capto to screen grab on Mac and edit the resulting screenshot the way you like: add captions and arrows, highlight or underline important parts, and what not. When you're done, you can save the screenshot in the format and resolution you need or just share it via Mail, Messages, Dropbox, Google Drive, etc. To keep your captures and recordings in one spot, you should try Dropshare. Setapp users get a complimentary plan from Dropshare – 10 GB of free storage. Should you take tons of screenshots for any specific task, your disk space won’t drain. What’s more, Dropshare ensures your content travels safe. You can share your screen recordings as password-protected links. CleanShot – surprise, surprise – helps you take clean screenshots. With this small tool, you can forget about desktop clutter. In a few clicks, hide the icons and set a custom wallpaper for your screen recordings. Less fuss – more tidy screenshots. All of these are free to use via Setapp, a subscription service with some 100+ Mac apps. Screenshots are automatically saved to your Mac desktop as .png files and named “Screenshot date at time .png,” where “date” is the current date and “time” is the current time. If you want to save screenshots to the clipboard instead, press and hold the Control key in addition to the screenshot command keys. So, to save a screenshot of the whole screen to the clipboard, press Control + ⌘ + Shift + 3. Create a folder call Screenshots and place it where you want screenshots to be saved. Done! All screenshots you take from now in will be saved in that folder. You can open your screenshots with Preview, Safari, or other image editing tools such as Capto. How to automatically upload a screenshot and copy the URL to the clipboard after capture? If you need to share a screenshot quickly online, you’re going to need help from an app. For single screenshots or video recordings, use Capto or Dropshare. Both make the process simple and both are fully integrated with major cloud sharing providers. If it’s a GIF that you want to upload, Gifox is the go-to app. 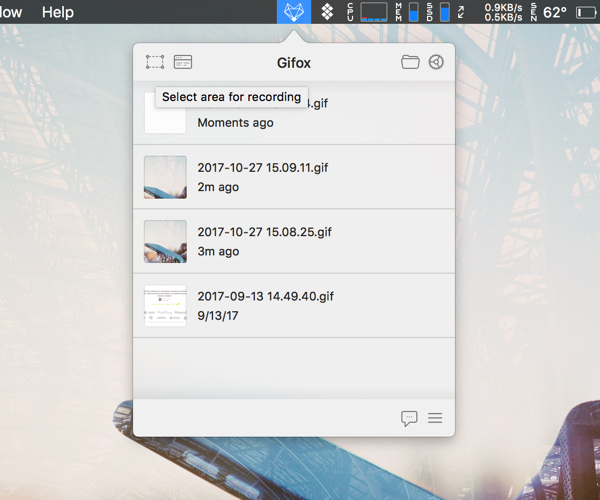 Capture your GIF and use Gifox’s drag-and-drop tool to upload your creation to Slack, GitHub, imgur, Google Drive, and more. All three apps are included for free with a Setapp subscription to download and use at your leisure. Mac screenshots are automatically given a default name of “Screen Shot” plus the date and time that the screenshot was taken. The format isn't very search friendly, especially if you take a lot of screenshots. Fortunately, you can change the file name to something more suitable with a command line. Enter the following command line: defaults write com.apple.screencapture name "Your Chosen Name" and press Enter. Now, whenever you take a screenshot, it will be saved under your chosen name. If you want to get rid of the date and time, swap out the command in step 2 for “defaults write com.apple.screencapture "include-date" 0. For professional looking stop-motion videos (which we’re guessing is what you want), use Capto. Not only is it a high-quality video editing tool, it features everything in one place so that you can capture multiple screenshots and drag-and-drop them in order of succession. The app even lets you add annotations, text, and apply arrows for greater personalization. Plus, when you’re done you can upload videos directly to your YouTube, Tumblr or Evernote accounts. Now, when you create tutorials, tech reviews, or bug reports you want to be able to demonstrate everything that happens onscreen in motion. In such cases, a simple snapshot won't do. Fortunately, there are a hundred and one apps for that purpose, including Apple's own built-in screen recorder QuickTime. Click File in the menu and select New Screen Recording. In the window that pops up, hit the white arrow to pick which microphone you want to use and whether or not you want to show mouse clicks. Hit the red recording button. Follow the instructions to record the whole screen or a selected area. To wind up the recording, click the stop button in your menu bar. After you record the video, you can use File and Edit menus in the menu bar to finalize some basic editing, rename the video, and choose where to save or share it. There are pros and cons to using QuickTime Player for screen recording. Like most default apps, QuickTime is free and easy to use. You can also record audio through either your Mac’s microphone or an external one, and choose whether or not to show the mouse pointer on screen. But as many default apps go, QuickTime Player is also somewhat limited in its functionality. The only choice for editing recordings once they’re complete is to trim the beginning and ending. There’s no option to add titles, additional images, or call-outs. If you want to record your Mac’s system audio, you’ll need additional software to re-route it, so QuickTime thinks it’s coming from an external microphone. Finally, when you’re done recording, the only option is to save it as a movie file — you can’t share it directly to YouTube, for example. To seriously edit the video you've recorded, you'll need to use another piece of software, so you might as well save yourself the trouble and use one app for both screen capture and post-production. If you want to know how to record video on Mac easily, try the Capto app we mentioned earlier. Unlike QuickTime, it lets you record screen activity, webcam video, computer audio, and voiceover all at the same time, as well as choosing between recording a portion of your screen or the entire display. Capto boasts much more editing power too: you can add captions, graphics, and other elements that come in handy in explanatory videos. On top, you can mute, fade in, or fade out both of the audio recording tracks to get professional sound without clicks and keyboard noise. Hit Record at the top of the window and select Screen or Area. Check the corresponding boxes in the menu that appears to include computer audio, microphone, and camera video. Hit the red round button to start recording. Click on the blinking red icon in the menu bar to stop recording. Now the video is saved in Capto and is ready for editing. You can play with controls on the left to tweak the sound, trim, add annotations, highlight specific areas, adjust the size and placement of the camera video, and so on. If you are not sure whether you want to purchase Capto yet, you can try it free on Setapp and decide whether or not it works for your video making needs. A collection of the best Mac apps, Setapp also features complementary tools like a video converter, media player, YouTube downloader, and about 100 more for a monthly cost way lower than buying the apps one by one. While GIFs may be mostly familiar to you from your Twitter feed, they are a surprisingly good way to make animated screenshots for quick how-to's and issue reports. Oftentimes they work even better than video, because they are lightweight and will be automatically played in your email or Slack message. Plus, you can use them in tutorial articles like this one without adding too much weight to the page. Apple hasn't embraced GIFs yet, although with emoji in the Touch Bar already being a thing, you might as well expect a GIF maker in the next macOS update. For now, however, you're going to need a third-party tool for animated screen capture. Gifox is one cute little app that does the job well. It lives in your menu bar, so when you need animated screenshots, just open it and record a GIF in a few clicks. Gifox gives you plenty of control over how fast your GIF plays, how many times it repeats, and how high the quality is. You can even add a fancy shadow to it. Select Area or Window in the upper left corner. Click the Stop button in the menu bar when you're done. So sign up for Setapp now to use both for a week and see how you like them. Besides, Capto and Gifox, there are over 120 apps on Setapp that make life easier for people looking for audio recording, saving a screenshot, and creating video tutorials and manuals. Get yourself equipped and share some screen activity — be it a screen grab on Mac of a strange bug the QA guy at work has to see or a quick how-to for your tech-unsavvy loved one.